Peter Semchuk, FCSC, RSW, CCCA, was also a Life Award recipient. Semchuk joined CSC in 1989 and was elected to the Edmonton Chapter executive in 1993, where he went on to serve as officer specification writer, vice-chair, chapter chair, and chapter director. In 2001, he was elected to the CSC Executive Council as 4th vice-president. He acted as CSC conference co-chair for the successful joint CSC/CSI conference in Banff in 2002. Semchuk also served on the Technical Studies Committee and was president in 2004/2005. In addition to receiving his Certified Construction Contract Administrator (CCCA) designation in 1999, earning his RSW designation, and being inducted into the College of Fellows in 2006, he has received a Chapter Award of Merit, the Eureka Club Award, a National Award of Merit, and an Education Certification Committee Program Director Award (2008, 2009, and 2015). Semchuk played an active role in the development of a number of joint CSC/CSI initiatives, including the MasterFormat expansion task team and the Overall Construction Classification System (OCCS) table development. 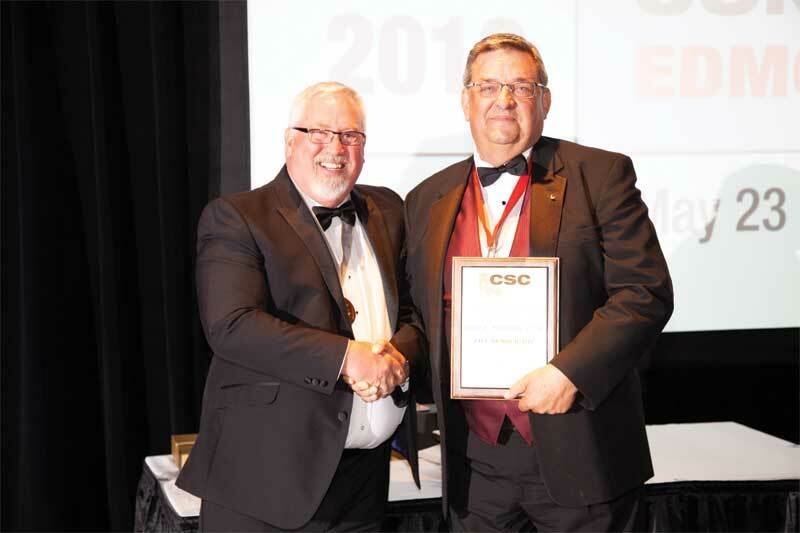 He continues to provide direction and support for numerous CSC activities and initiatives. He was a driving influence on the development and updating of CSC’s Manual of Practice, served as chair of the CCCA Subcommittee for several years, and recently took on the role of chair of the RSW Subcommittee. He continues to be active as an instructor at the chapter level and for CSC workshops. Following the award presentations, President David Boyle, CTR, introduced incoming President Paul Gerber, who touched on what lies ahead for the association and the design-build community. The formal program was followed by a night of dancing. Brenda Thompson of the Winnipeg Chapter accepts the Lloyd Boddy Chapter of the Year Award from CSC executive director Nick Franjic, CAE. The President’s Chapter Award encourages and recognizes active, forward-looking chapters in categories ranging from membership growth and education programs to financial contributions and meeting attendance. This year’s qualifiers were Atlantic, Calgary, Edmonton, Grand Valley, Montréal, Québec, Regina, Saskatoon, Toronto, Winnipeg, and Vancouver Island. 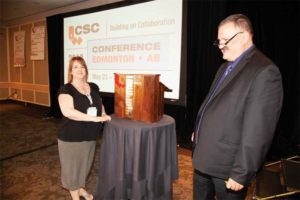 When it came time to decide the best of the best and hand over the Lloyd Boddy Chapter of the Year Award, Winnipeg was the winner, excelling in areas such as professional development opportunities, spirit, and participation in local industry and CSC committees. Edmonton—Jeff Halashewski, RSW, and Shaune Smith, CCCA.